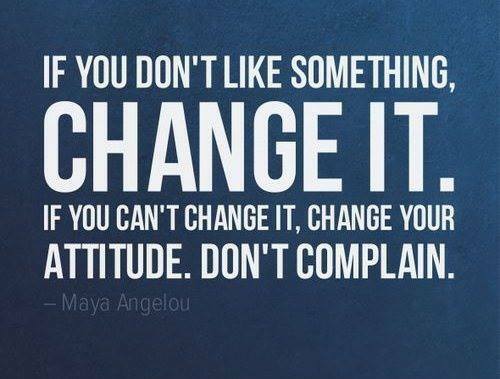 One of the most difficult things in life must be ´not complaining´ There is a genuin tendency of people to complain. People complain about the weather, morning traffic, speed of the train, the price, you name it and people complain about it. Even worst is that people complain about others, while a good look into the mirror is a better option. Do I never complain, ofcourse I do, I am only human. I learned not to judge on people, but sometimes it seams and feels really good. Or when the circumstances are not the way I want it, I can ´nag´ about it. I like to have certain things perfect in life. So I admit I am not perfect, but I am always improving on it. And that is because of a positive attitude. Whatever happens I try to stay positive and be grateful about the great things live has to offer. And this is one of the most important things in succeeding in life and business. Change your attitude, when it rains, sing; when traffic is stuck take a walk; when the train is slow; read a book; when the price is not right, don´t buy. Please change your attitude to the positif. In business you will have set backs everyday, it is part of your succesful journey and with the right attitude it will make it a much more joyful experience. And if you doubt you cannot do this, let somebody close help you by mentioning it everytime you complain. I know my wife hasn´t given up on me!